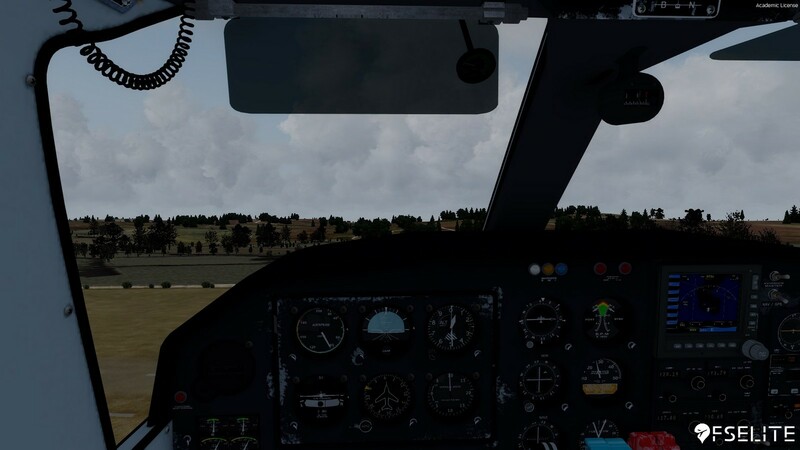 BlackBox Simulation, which for practical purposes I will call ‘BBS’ for short, has been around for some time and has been known to make a wide range of aircraft products, from the Scottish Aviation Bulldog, to a fleet of Airbus aircraft. 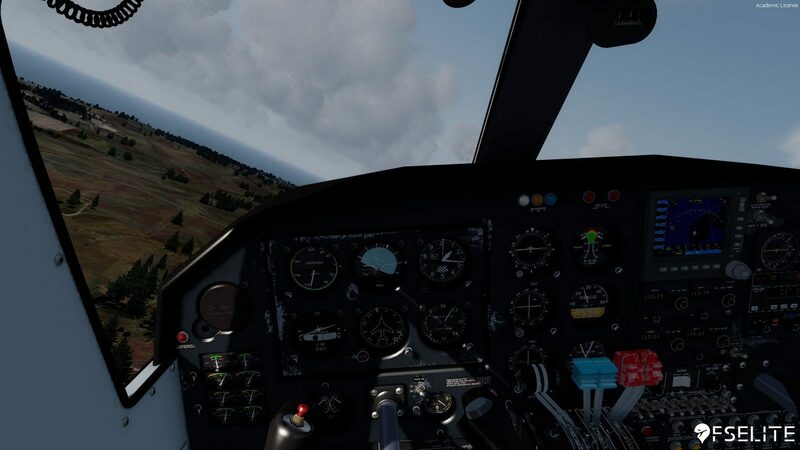 Although these aircraft are not as detailed systems wise compared to other mainstream developers, BBS makes some pretty good products that are still fun to fly and it means users don’t have to spend a large amount of time setting up the aircraft – they can just hop in and fly. 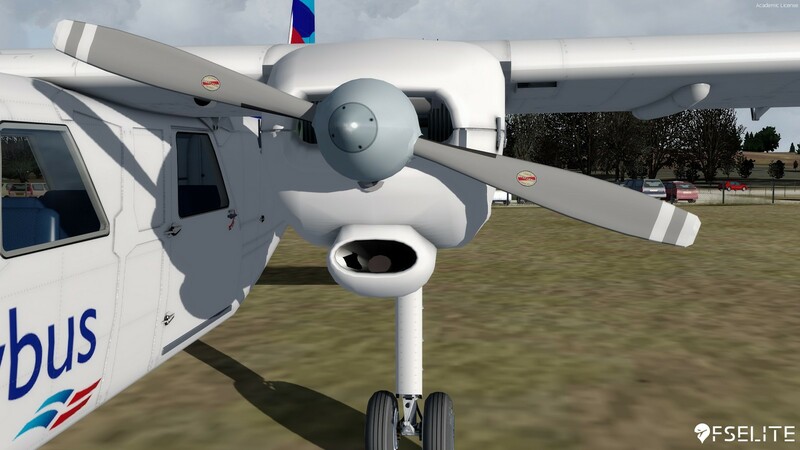 Recently, the team released their Britten-Norman BN-2 Islander product. The Islander is a 9-seater twin engine piston-driven (or sometimes turboprop-driven) light transport aircraft, which is actually still in production to this day. In fact, for the small sum of £1,000,000, you can buy yourself one. 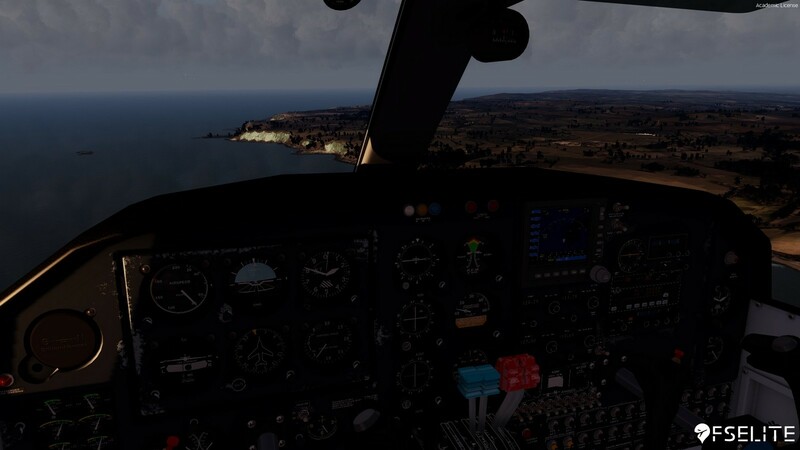 So has BBS given the flight sim community a sustainable product that will keep you entertained on those short, challenging flights to places such as Lukla and Barra? Find out in this FSElite review. Let’s start with the installation of the Islander. 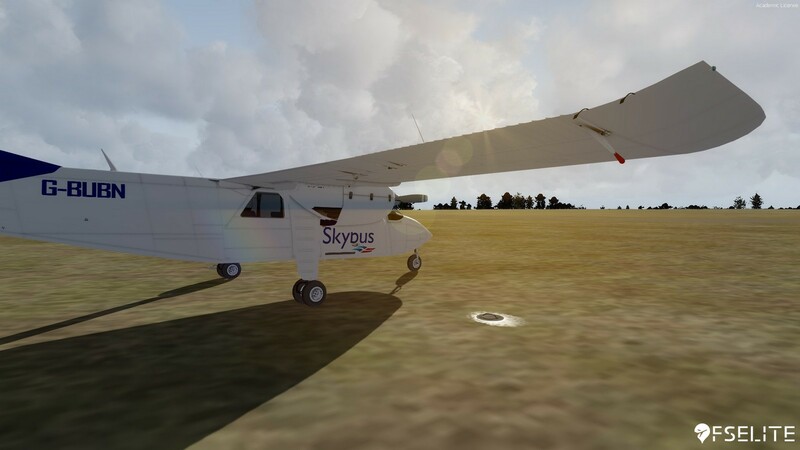 As with most installers, you accept the license agreement, enter your serial number (leaving it blank installs the Islander in demo mode), click next a couple of times, and tell the installer where your main flight simulator directory is located. However, it will find it by default if there are valid registry entries pointing to your simulator. 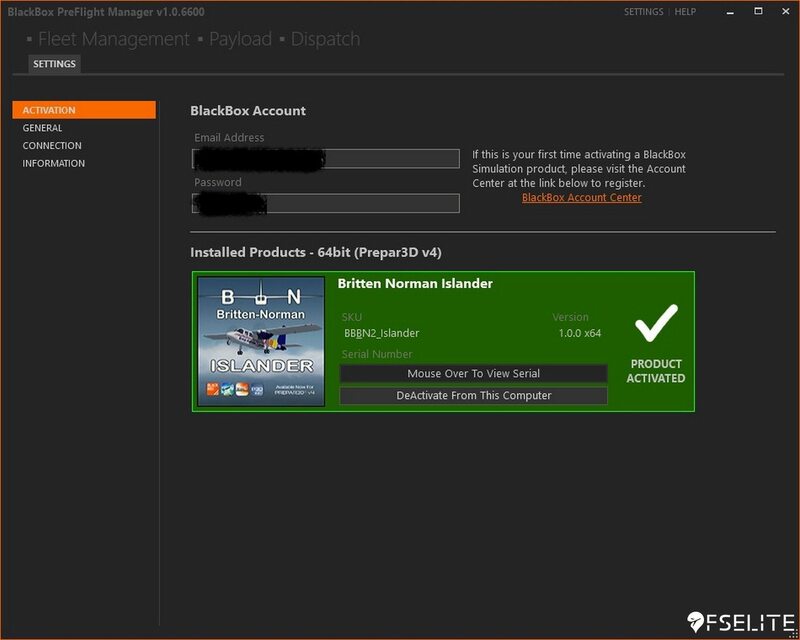 After the install is complete, the second step is to run BBS’s own utility tool, ‘BlackBox PreFlight Manager’, and activate the product. Again, this is an easy process and involves logging into/creating a Black Box account and clicking the activate button. Quite frankly, I love the activation system as it means the product can be remotely deactivated in the case of reinstalling Windows – for example, when you have no activation slots left. This is done by logging into your BlackBox account. 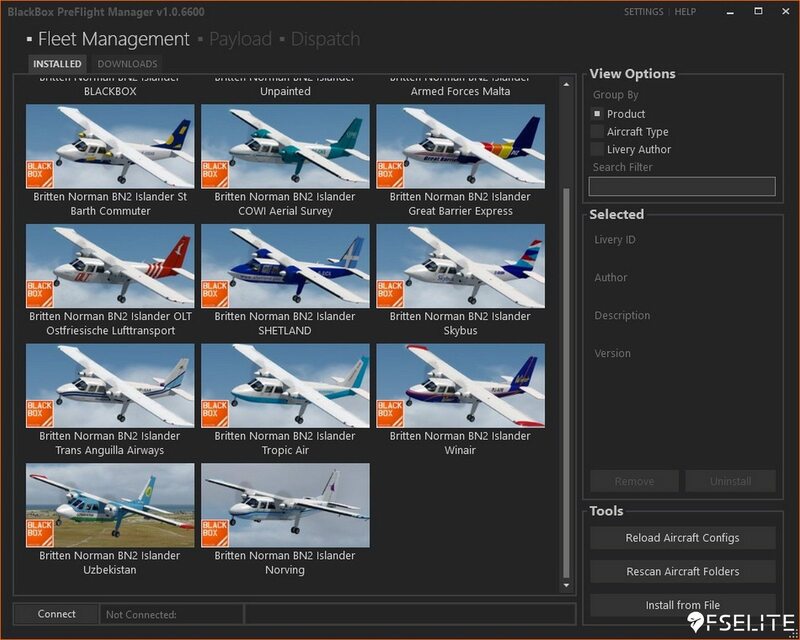 However, PreFlight Manager is not just for activating the product. 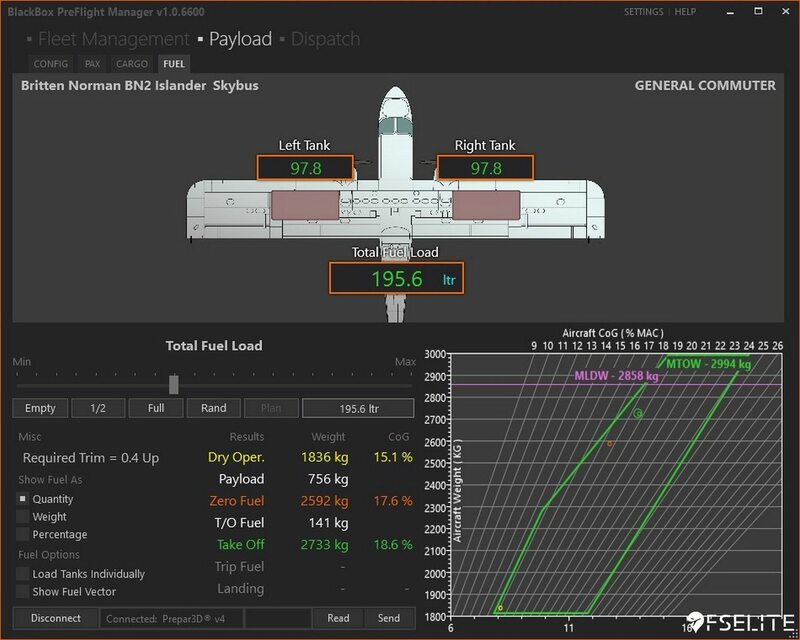 It also acts as a configuration tool where you can download liveries from BBS’s server (at this time of writing there are no current downloads, although 14 liveries are included with the install), change your preferred measurements of weight/distance and how much the pilot/passengers weigh, and manage the fuel/payload for the flight (the tool includes visual graphs to help aid this). On the Payload and Fuel pages, you can also switch between seeing the measurements in quantity, weights or a percentage which is a nice touch. Furthermore, inside the sim by pressing Shift+2, there are more options for adjusting the aircraft on the fly. 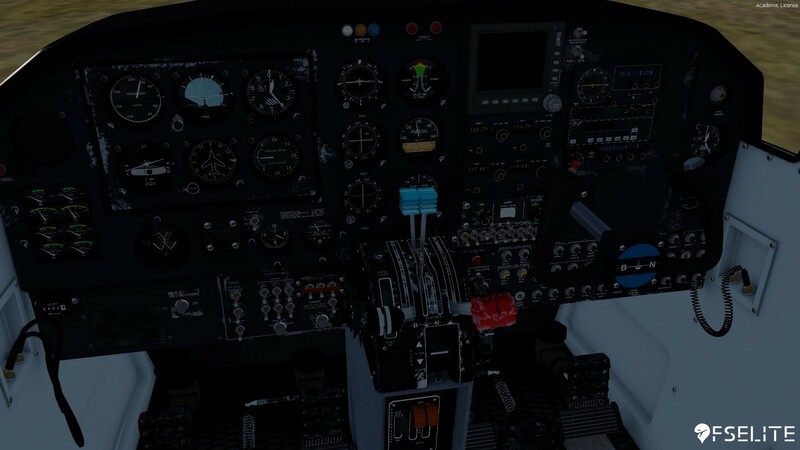 These include enabling the GPS in the cockpit (sadly it is not a custom one and is the default one in the sim), opening/closing the engine cowlings, and adjusting the volume. The product also comes with a detailed manual which I find fascinating to read. 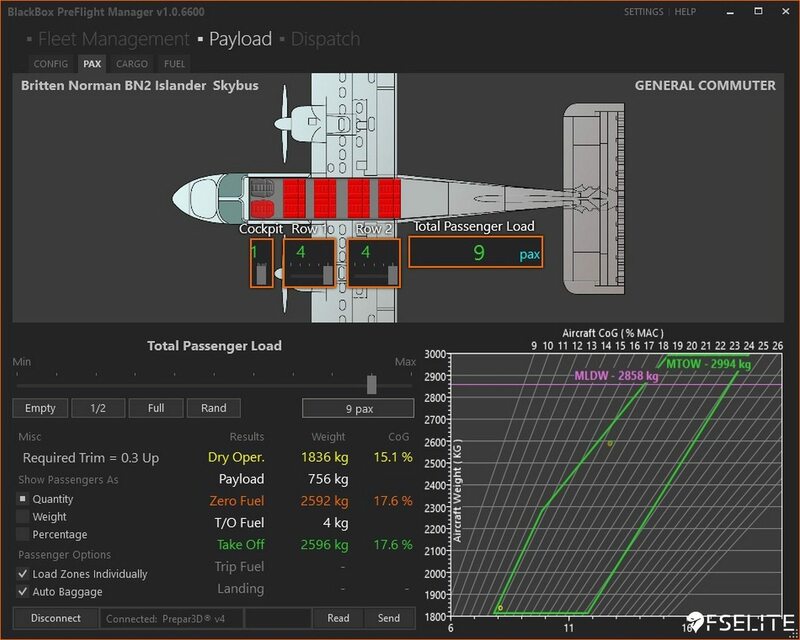 Not only does it talk about the various procedures involved in a typical flight, but it shows detailed diagrams of the various parts of the aircraft including the specifications for the 300HP engine type that has been modelled – and even instructions on towing the aircraft, which hasn’t been modelled in the sim but it is a nice touch to the manual. So how does the aircraft hold up in the sim? 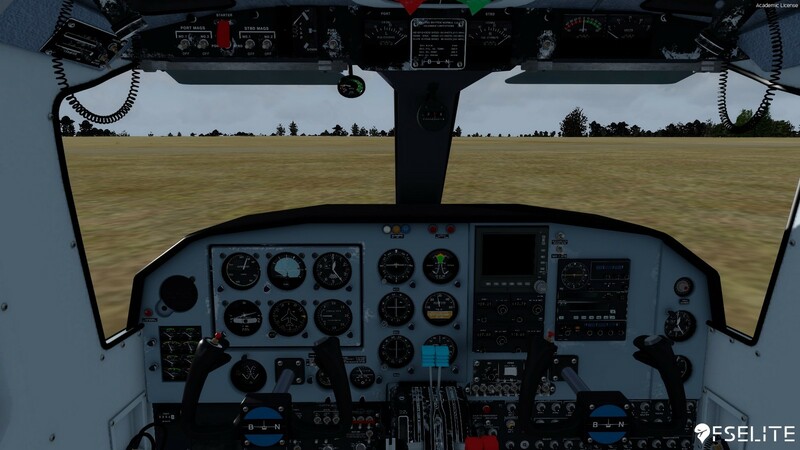 For this review, I am using P3Dv4 though the aircraft has also been made for P3D v2-v3, FSX and FSX Steam Edition. 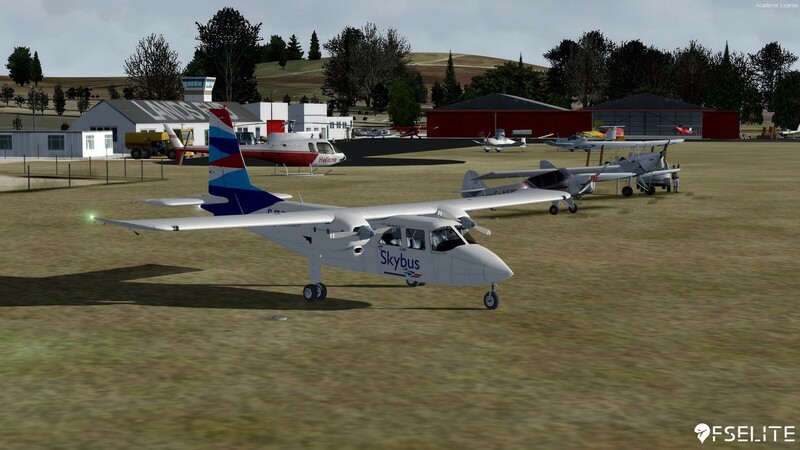 I will be conducting a short scenic flight from Lands End to Penzance and back to Lands End in time for a cuppa. 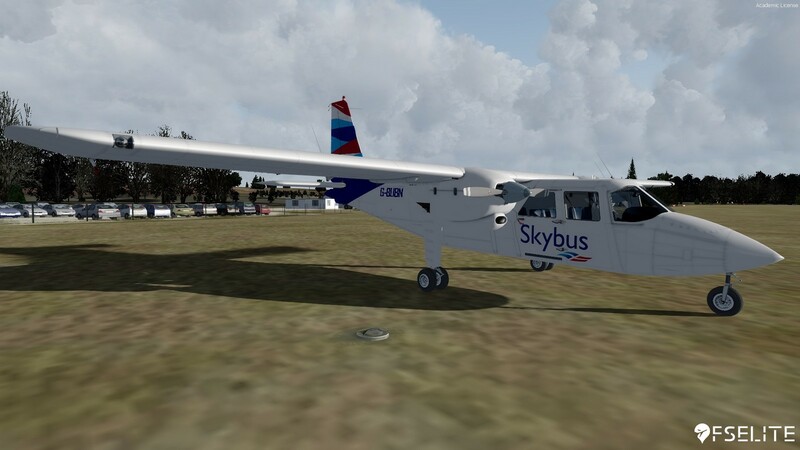 This flight is conducted in real life by the Scilly Isles’ own airline, Skybus, and it will allow for me to easily go through the aircraft with you. As is visible in the pictures above, I am taking 8 passengers plus myself on this flight and 195.6 litres of fuel as we won’t be needing much. Before we get underway, I want to talk about the performance of this aircraft. It functions well, although this is to be expected from an aircraft that natively doesn’t come with many systems. 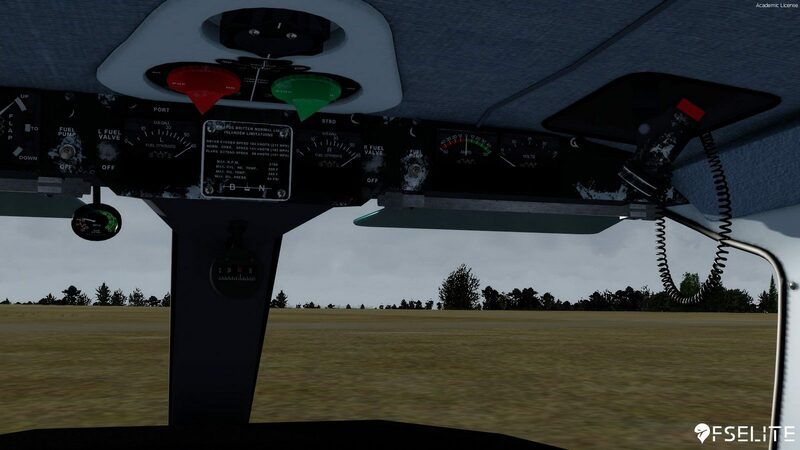 At UK2000 London Heathrow with my medium-high settings (8x MSAA, 4K textures, 16X Anisotropic Filtering, Dense Scenery etc) I was still getting 48-60 FPS depending where I was looking. At Lands End, I locked my FPS at 75 and I always maintained it. The only time I lost any FPS dramatically was when taxiing on grass and particle effects were created in an external view, but this may be attributed to my setup. 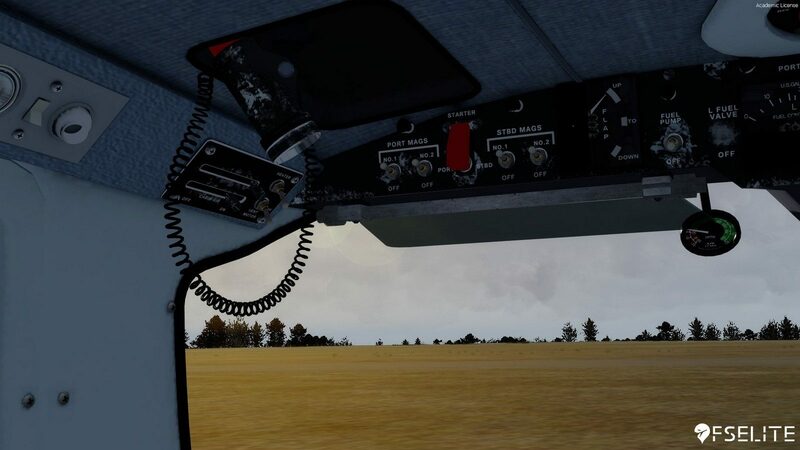 When you first load up the aircraft into the simulator, the engines will already be running. 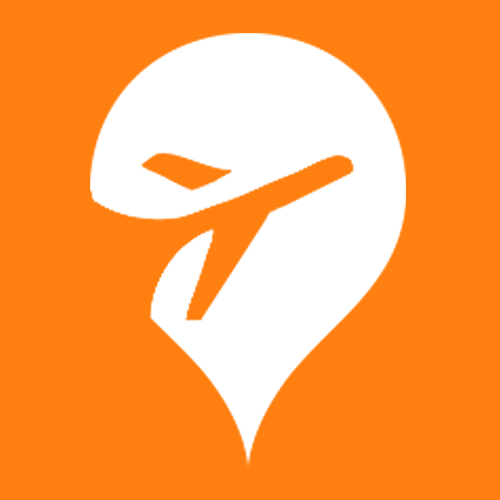 There is no option to start in any other state, although due to how simple the aircraft is, it is very easy to get it into any state you please. There is also a choice of four cockpit panel colours – blue, beige, grey and black (my personal favourite). Depending on the livery selected, the default colour will vary. 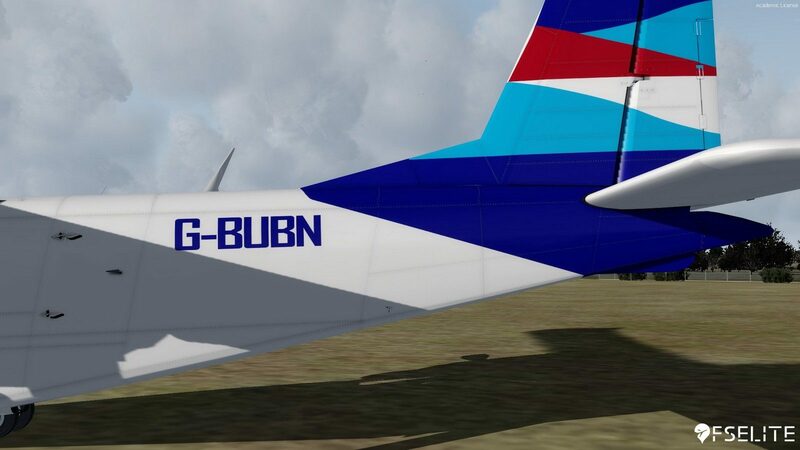 It is very easy to change the colour though – as easy as going into the main texture folder within the main aircraft directory, renaming the preferred colour to ‘BBS-BN2-PANEL.dds’ and replacing the file within the livery folder. There is no documentation on how to do this, although it was very easy to figure out. It would have been nice to see this in the manual though as not every simmer will be have the knowledge when modifying files without breaking anything. In the future, I think BBS could add an option in the PreFlight Manager to make it easier for simmers when they just want to fly. The first stage of any GA flight is, of course, to do the walk around. As I walk around the aircraft, there clearly has been some attention to detail given by BBS. The shape of the aircraft and modelling is pretty much spot on. The blades of the propellers look superb, oil marks can be seen under the wing and there is even writing such as “External Power 24v” where appropriate. Although the textures themselves could be improved to look more high definition. Lower definition textures do help with performance of course, but considering other add-ons of a similar complexity look much more visually appealing yet perform just as well. 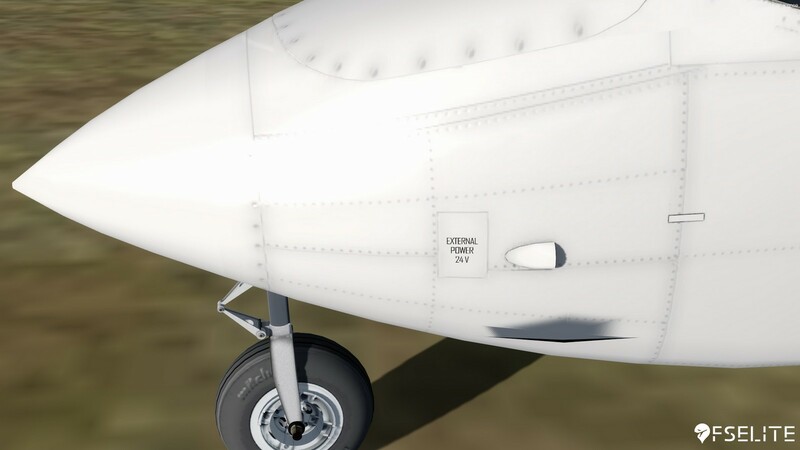 The captain’s door, both passenger doors and the cargo hold door can also all be opened to add to the immersion. 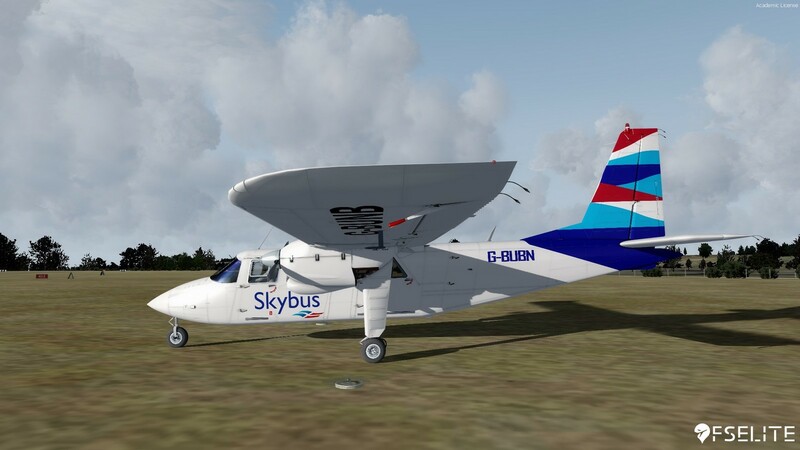 I do love the Skybus livery and I think that whoever made the liveries for the aircraft really did a great job at capturing detail. 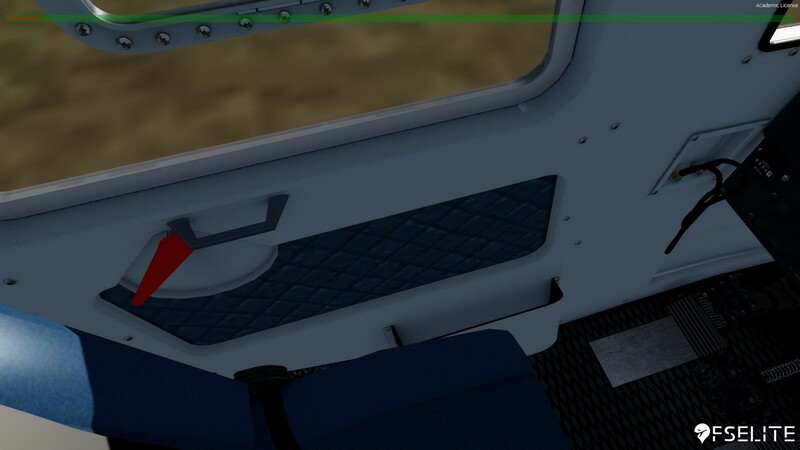 You can also see the pilot from the external view which is a nice additional feature, and he’s disabled when inside the aircraft so it doesn’t affect performance or your view. There are a few minor bugs, however. 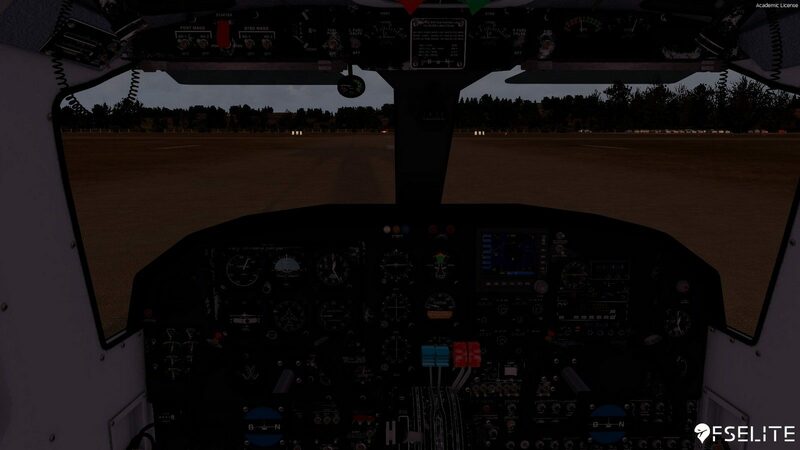 The first is when you first load up the aircraft, the red light of the anti-collision light can be seen in the cockpit. It is easy to solve, however, by turning off the light and then switching it back on again. The second bug is that even when the battery is off, some of the lights still turn on – such as the strobe lights, nav lights and the anti-collision light. Hopefully these will be fixed in a future update, although they are not bugs that will stop your enjoyment of this aircraft. The textures, especially around the instruments, although they could have a higher resolution still good. The addition of dirt and scratch marks adds to the immersion of flying an old, rugged, and used aircraft. The instruments themselves have been modelled well too. 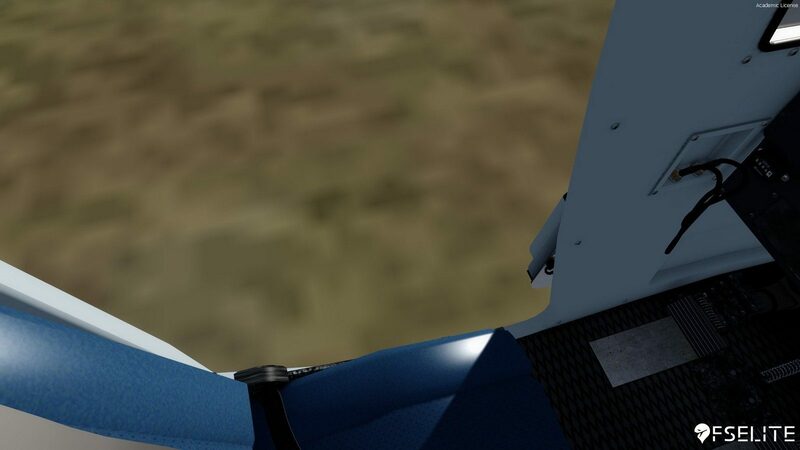 The camera in the sim can be far away and they are still clearly visible. I do think BBS could have focused more on getting the basics right in the cockpit first however. For example, although most of the switches have been modelled, not all of them have a function. The transponder is a good example. 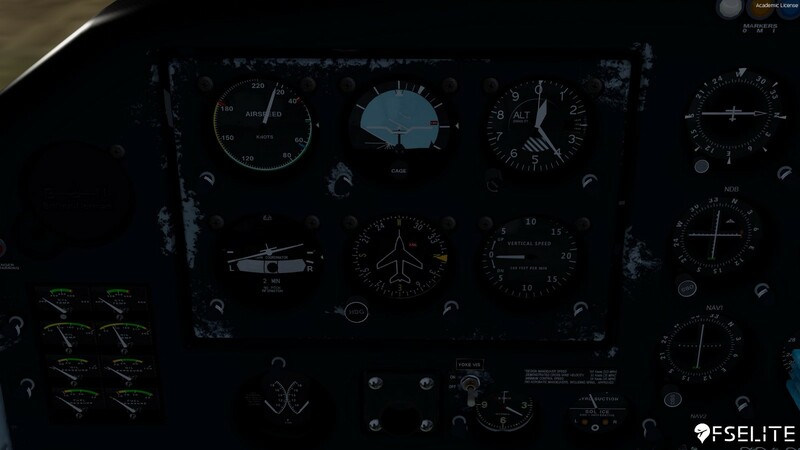 The transponder is on by default so flying online will not be a problem, but you won’t be able to toggle it off though and some users may find this frustrating. There are also two switches that disable the yoke. These act independently of each other and do make it easier for seeing switches located behind the yoke in critical stages of flight. Starting the aircraft is a breeze. 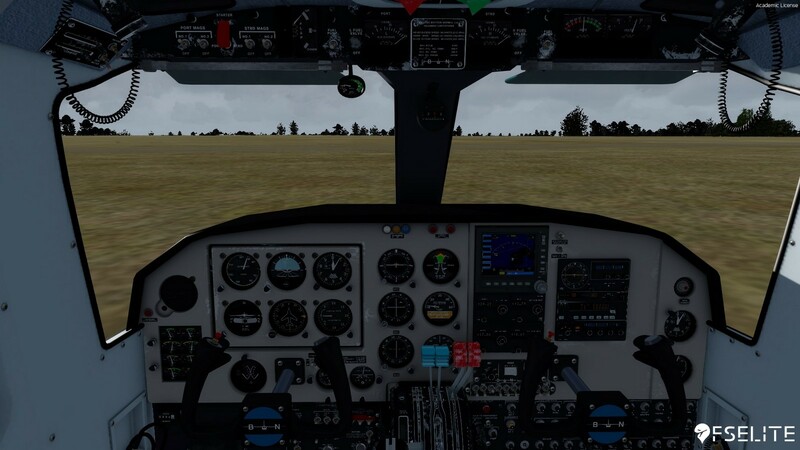 Simply turn on the battery, put the mixture and prop pitch leavers to max, turn on the magnetos and the engine booster pumps, and away you go. This is the first time you will hear any major sounds. On the ground, I don’t think the engines sound as good as they could be, although they are by far not the worst either. In the air, on the other hand, when the engines are at a higher power setting, I think the sounds are fantastic – especially during takeoff. 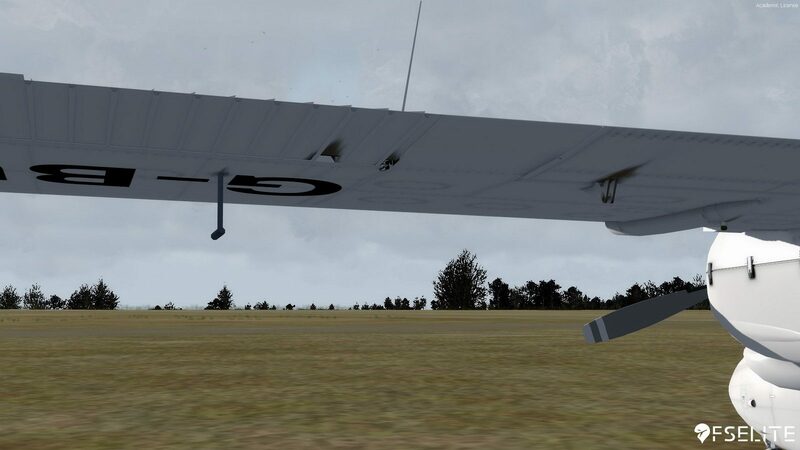 I quickly moved the flaps to takeoff position and watched the flap indicator, as well as looked at the wings to see if the flaps have followed my input – and they have. 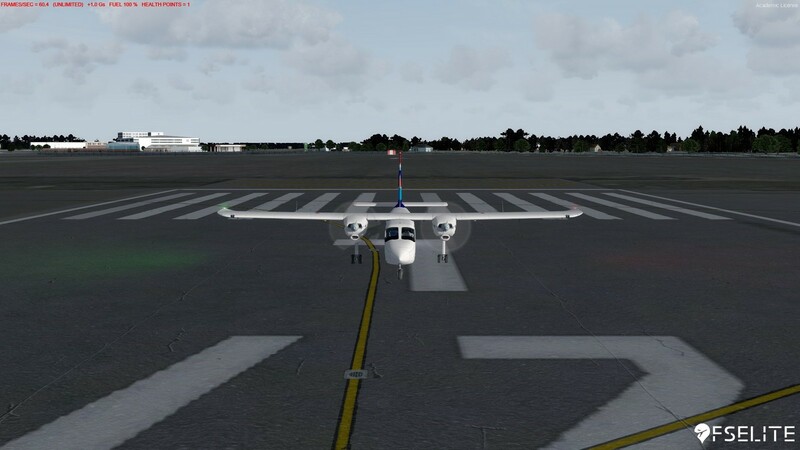 As I taxi towards the runway, the particle effects I mentioned earlier can also been seen. As I taxi down the runway, I have to put the sun visor down to stop the sun going into my eyes, which BBS has also modelled very nicely. 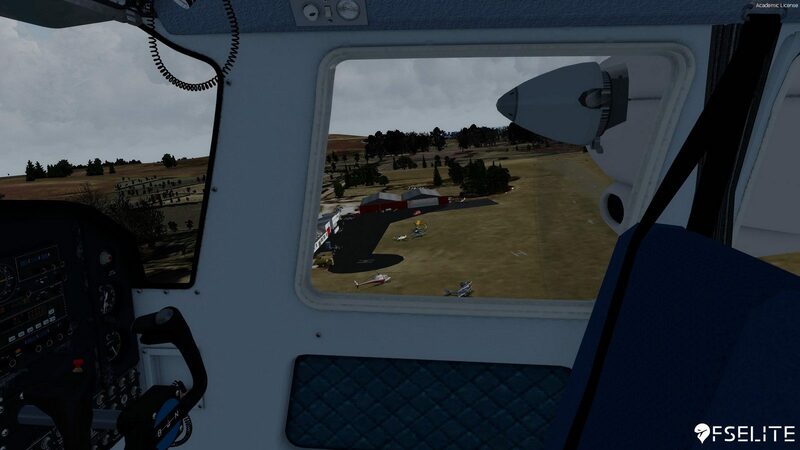 As I takeoff, the aircraft feels really smooth in its handling – just like it is supposed to be in the real world. 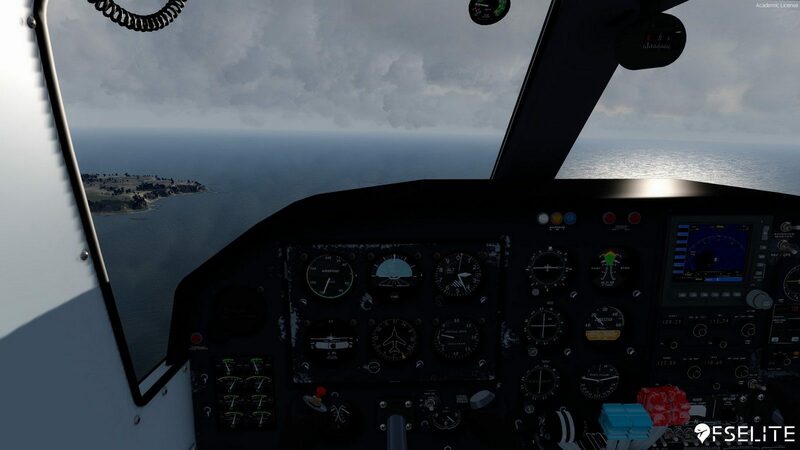 By adjusting my attitude, I can maintain a steady airspeed before making a 30 degree turn towards the sea. To be honest, I really love hand flying this aircraft, especially as you pretty much have to as it feels very natural. 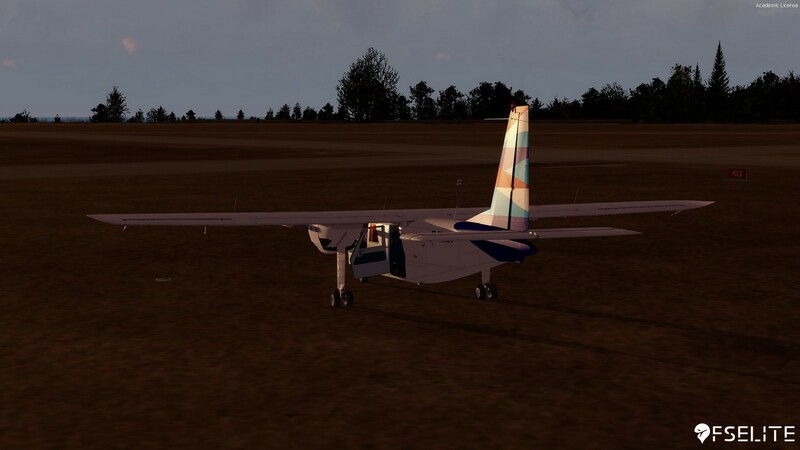 Although you can use a basic autopilot system, it is a lot more joyful to fly it manually, especially as you won’t be flying for 9 hours straight in the Islander. With the flaps away, I climbed to various altitudes to see if the aircraft stays there. 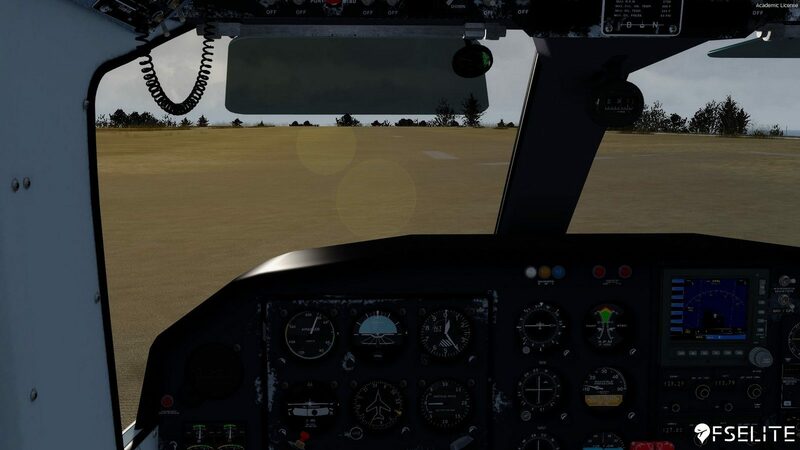 I also wanted to see if Active Sky would have drastic effects on the aircraft, but thankfully, even though winds were high it did not have a negative effect on the performance of the aircraft. I also reduced the prop pitch and the mixture due to being at a higher altitude, as less fuel going to the engine is needed. 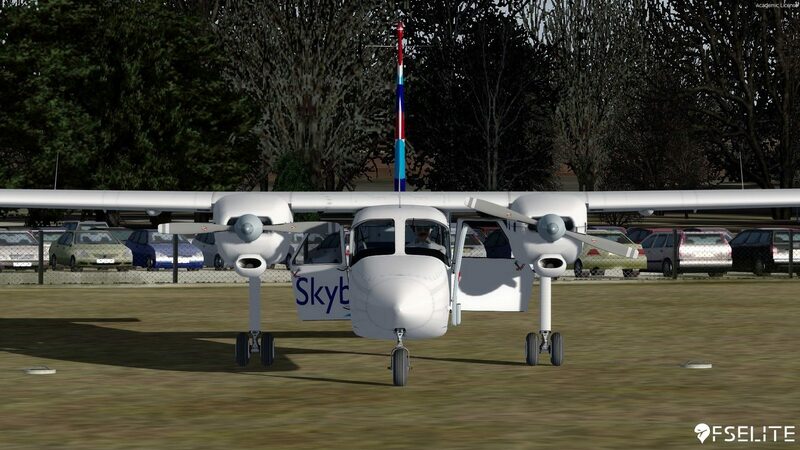 In the air, the Islander is stunning to look at – the props look almost volumetric when at a higher speed. 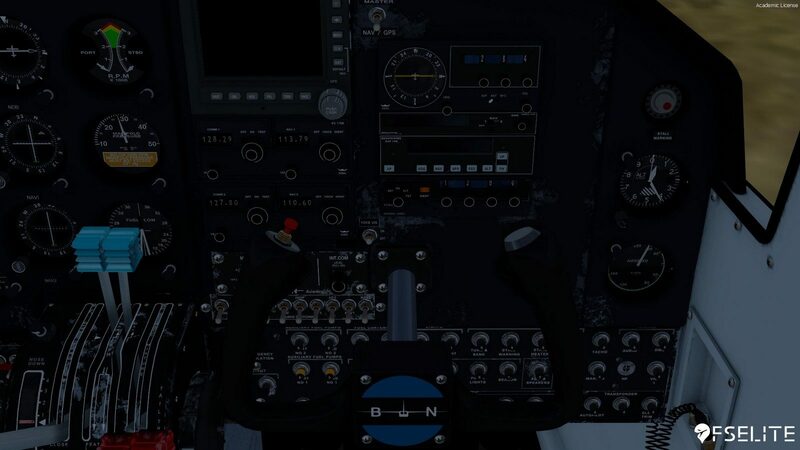 The instruments also responded very well to my inputs with no delay between the engine gauges and me changing the power settings, nor between my inputs and the inputs to the engines themselves. I also decided to look at the night lighting of this aircraft. 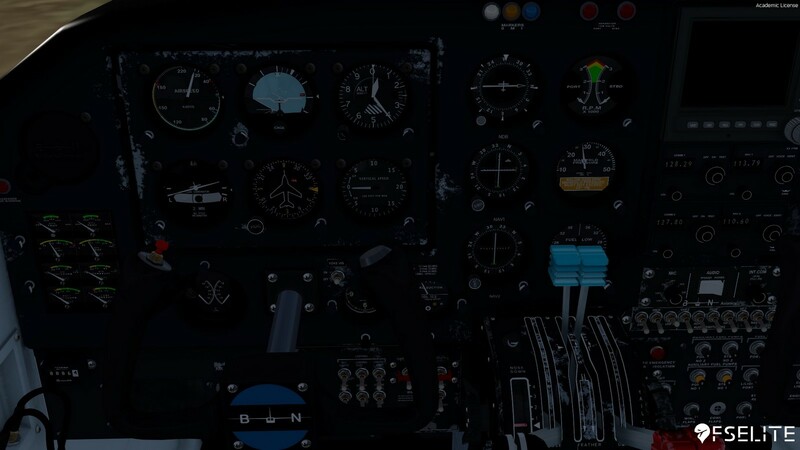 There are two main methods for lighting up the cockpit – lighting up the whole cockpit including the cabin, and lighting up the instruments. 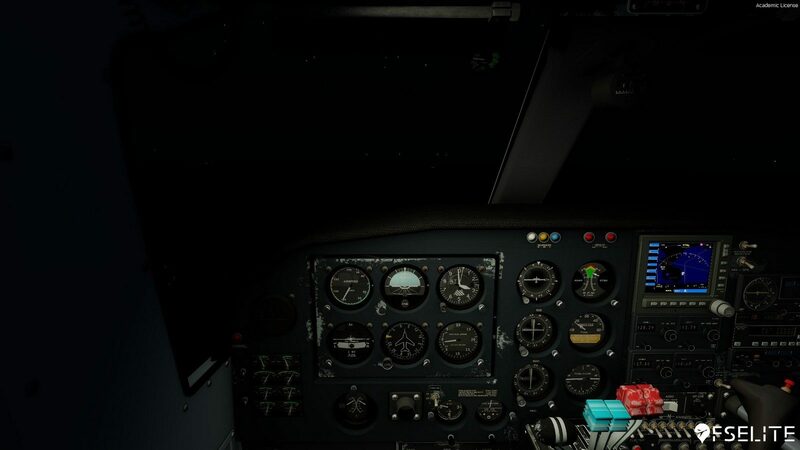 I think the lighting effects are really nice and make it very easy to still see the entire cockpit during dark hours. The external effects are gorgeous too. 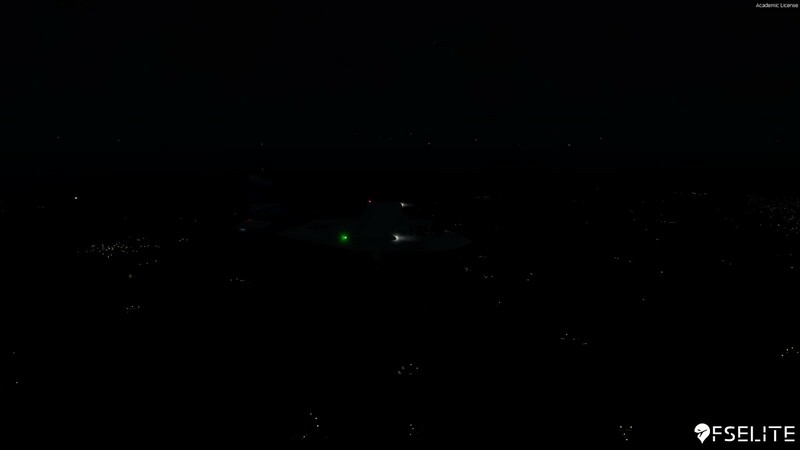 I love how you can physically see the bulb of the anti-collision light go around the aircraft, although this is dynamic lighting and is exclusive to P3D v4. As it got closer to sunset, I decided to head back towards Lands End. I was quite high for a landing but it was very easy to descend to a more suitable altitude. 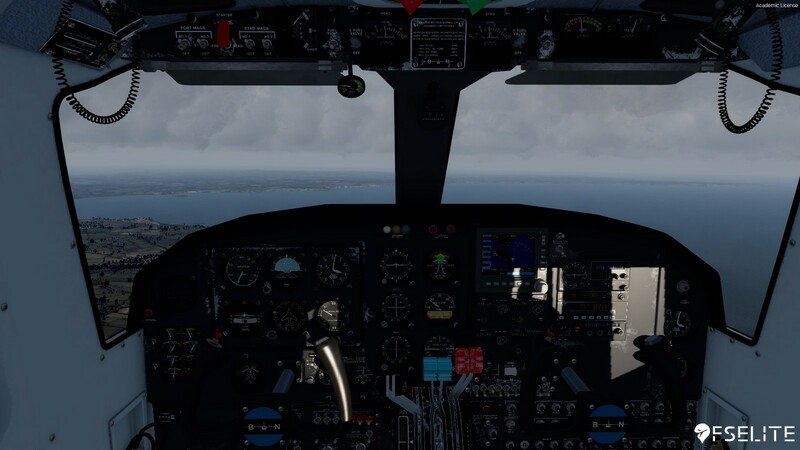 I also conducted the approach visually without using any VOR’s etc which is possible should you want to via the GPS. 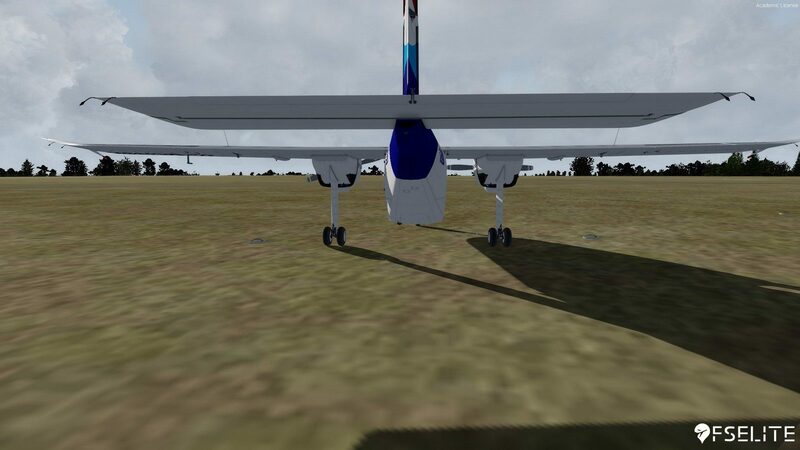 Approaching the runway at a 45 degree angle, I put the first stage of flaps in. I slow to around 80 knots and try to descend at 500-700ft per minute which I mainly did (though the wind was quite bad). The only thing I don’t like about the flaps is that the aircraft climbs before allowing you to descend again. 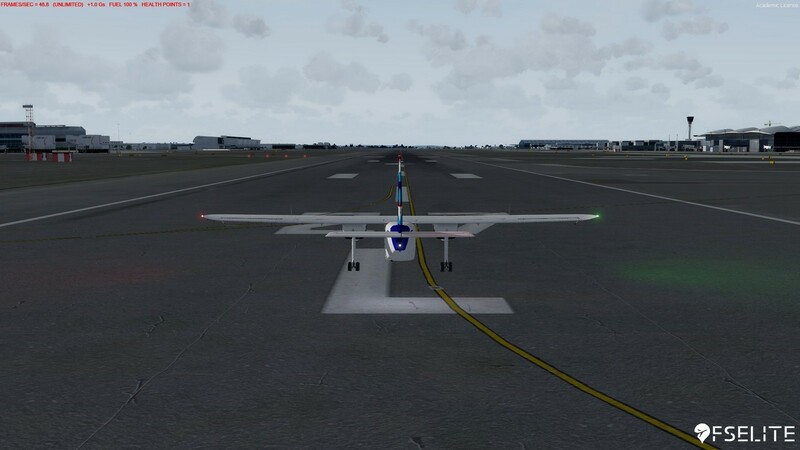 Lining up with the runway, I added the last stage of flap in and landed on the runway smoothly(ish). 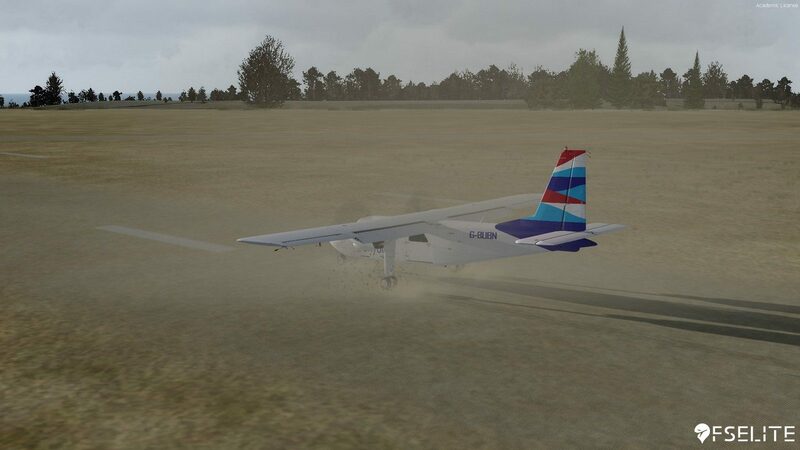 As to be expected from an aircraft certified for short takeoff and landing (STOL), the aircraft stops very quickly. After parking up and shutting the aircraft down, it was time to call it a day. 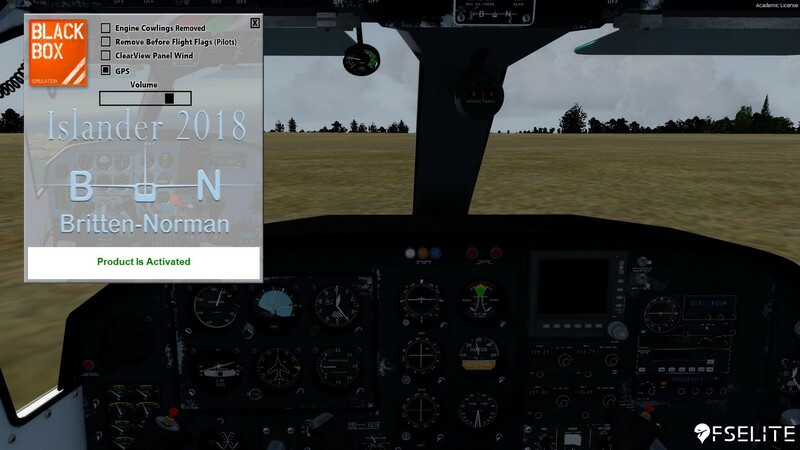 This was just one of the many flights I did with this aircraft. 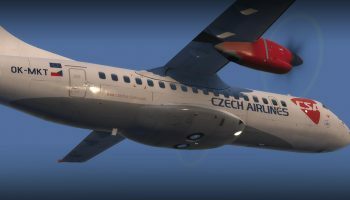 In conclusion, I don’t think the aircraft is quite worth 30 Euros due to the fact that no major other things such as failures are modelled, and there could be a few improvements to the product such as a few tweaks to the sounds and textures. I also think in the future, the implementation of a custom GPS would be nice along with the ability to fully use the transponder. 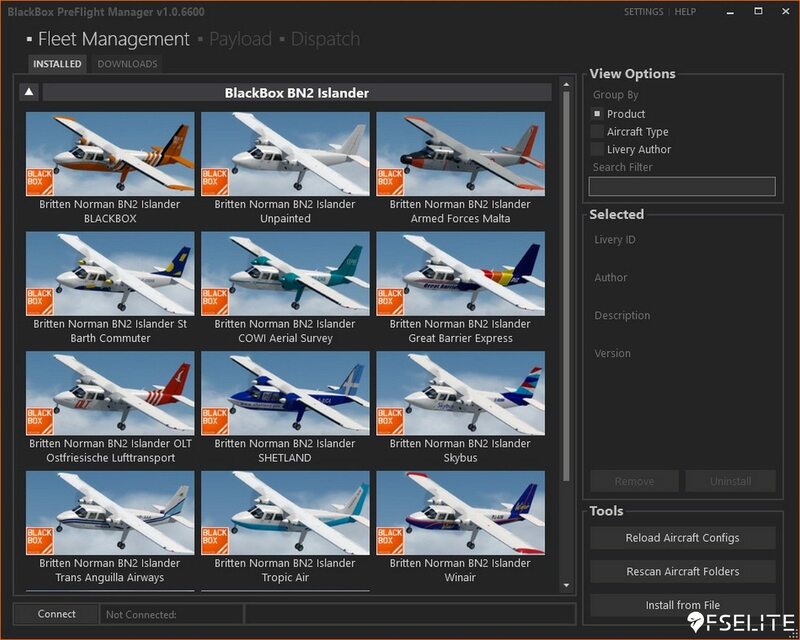 The aircraft is actually the same price as some of BlackBox’s individual Airbus aircraft, which have more features including multiple engine types and the ability to update the Navigation Data (the Islander’s GPS uses the default FSX/P3D Navigation Data and so can’t be updated). 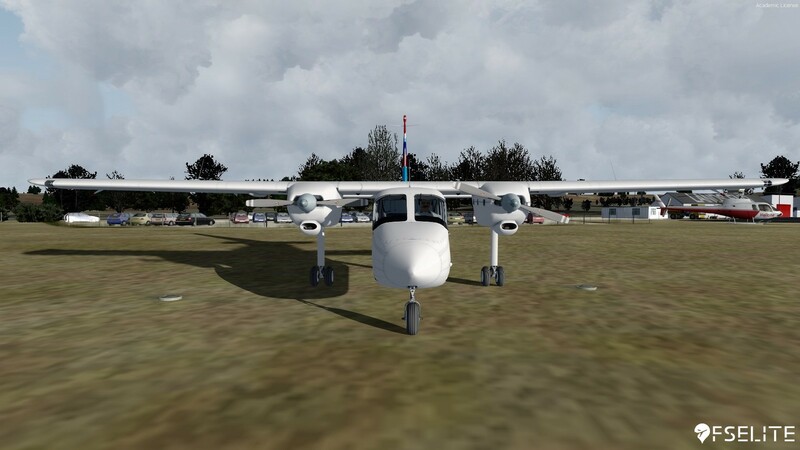 Even an equivalent payware GA aircraft, which costs around the same price as the BBS Islander has a custom GPS, panel states and more effects. 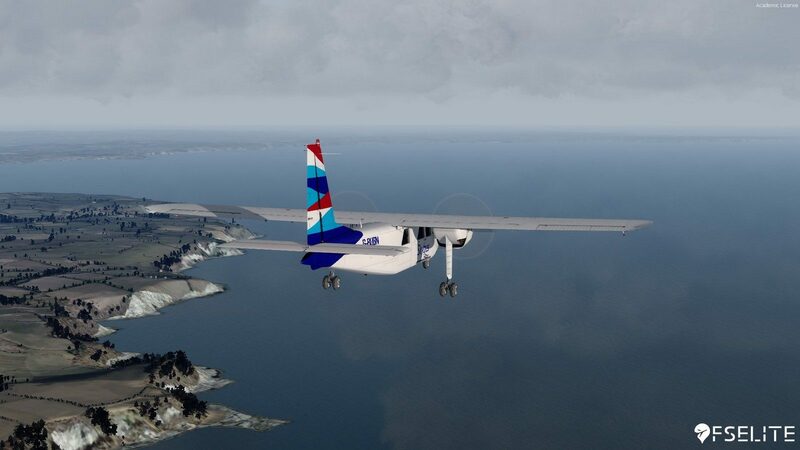 However, it is still a fun aircraft to just hop into and fly, and BBS has still provided a realistic simulation of the Britten-Norman BN-2 Islander, finished with a good flight model. 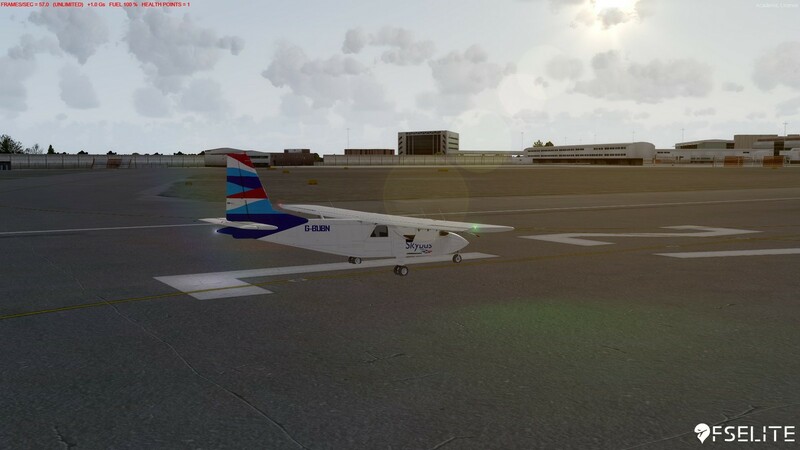 The performance is also very good even when I was using Orbx Global, Vector, OpenLC Europe and Active Sky. 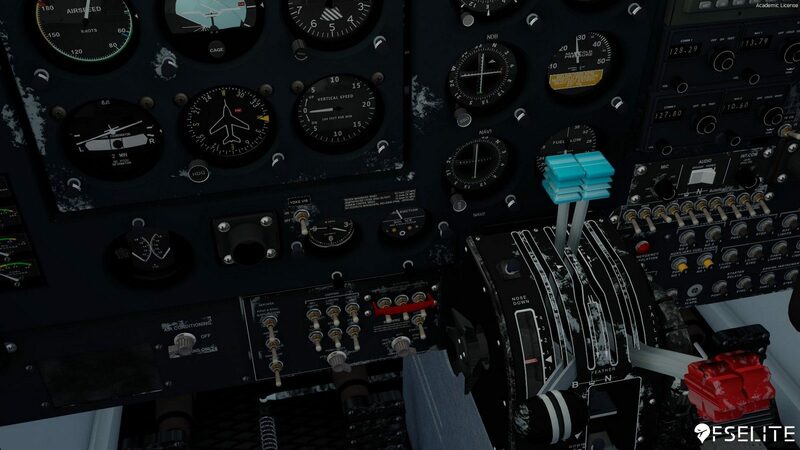 Having configuration tools to adjust the payload instead of using the default sim settings to do this also makes the product a lot easier and friendlier to use when it comes down to planning flights with this great aircraft. 6.3 Out of 10 How do we score? | Feedback? 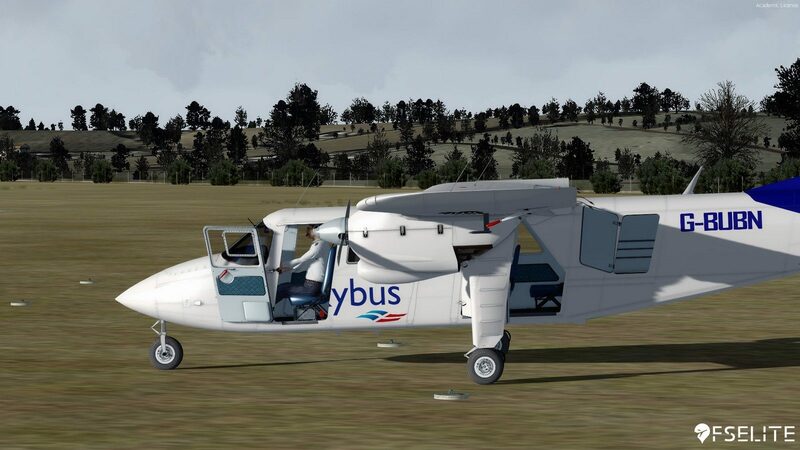 The BBS BN-2 Islander will keep you entertained, although it is not a study-level aircraft. It's fun to fly although It would also be nice to see some sort of failures added in the future. 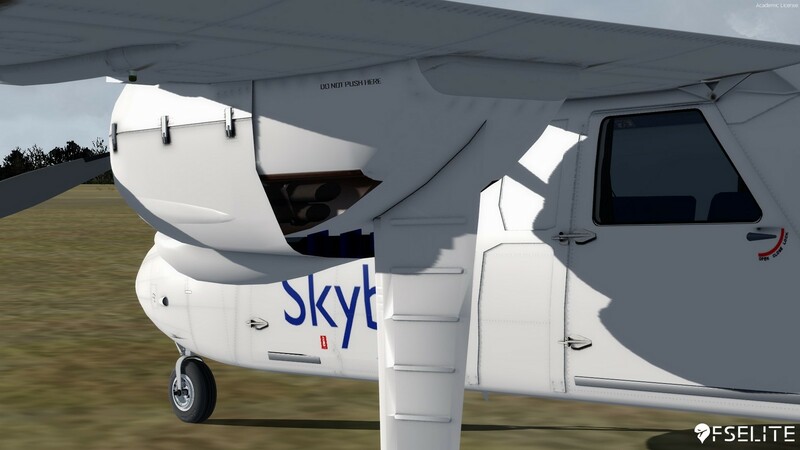 For an aircraft costing €30, I would have expected to see some more precision on the modelling of the aircraft in some places to increase the overall detail of the product, as well as basic systems such as the transponder. 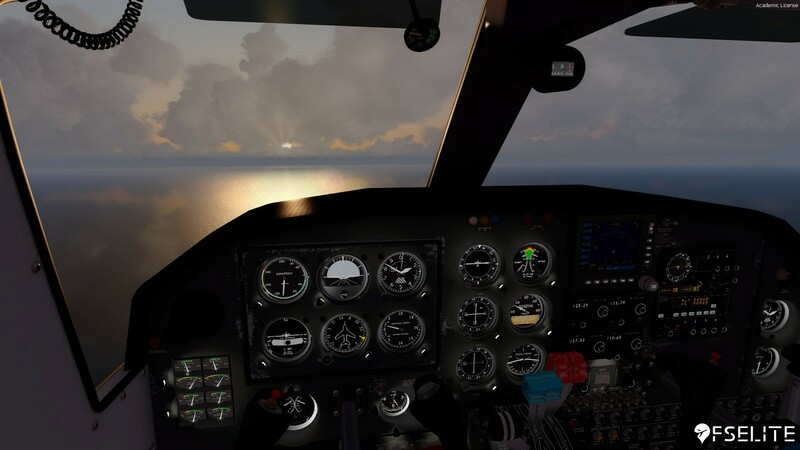 I have been an avid Flight Simmer since around the age of 6 or 7. 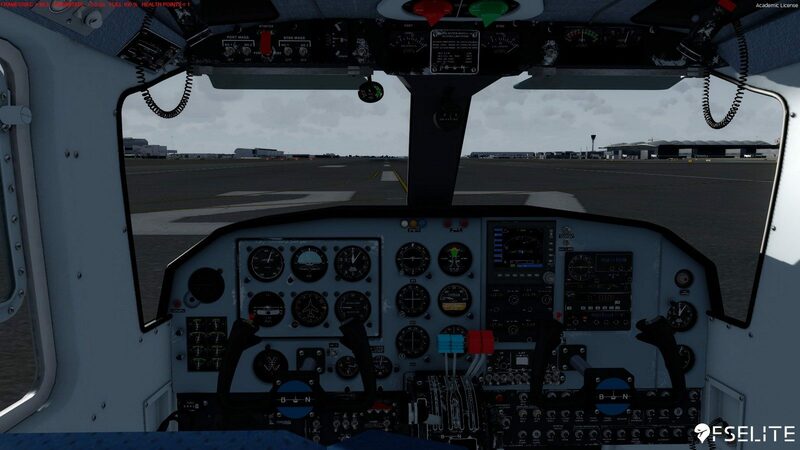 Starting with FS2004, I have worked my way up over the years through the various additions to each flight sim platform and I have finally settled with P3D V4. I have always wanted to be a pilot from a very young age, in fact my earliest memory is being on a plane to Austria! Being involved in both the Aviation Industry as a Student Pilot, and a Flight Simmer is a pure passion for me. In my spare time I write songs as a Musician, I write websites (and I host them) and I have interests in the Cyber Security Sector/Networking Sector.